*I was sent a copy of this book from the author in exchange for an honest review. *In this book, there is a law called the Parental Morality Law that was created by Riley's mother, Claire, after the death of her son. Under this law, the government has the right to take a child away from it's parents if they believe that the child is being neglected by it's parents. The child is then sent away to a government-run boarding school... or that is what everyone is told. Riley, our main character, is put on The Extraction List to be sent away and she ends up going on a journey to escape the Taskforce officers with her mother and Bo, who is her mother's best friend/"boyfriend." (If you read the book, you'll understand why I put boyfriend in quotations). They meet Cain, a killer who kills without hesitation, and also helps them along the way.I really enjoyed this book. It is easy to follow and it is engaging. The premise of this book caught my attention and I'm glad that I decided to pick this book out. I love how action-packed this book is. Since this is a fast-paced book, there were times where I wanted a certain scene or moment to last longer than it actually did but overall, the pacing was nicely done.I did like the characters but I couldn't connect to or relate to any of them. This is more of a plot driven book rather than character driven. Riley is a smart and strong character and even mature for her age. I like the relationship that Riley has with her mother. They're just not mother and daughter but they're like best friends too. Cain is one of those characters that you just want to learn more about. Besides the fact that he's a murderer, there's not that much we know about him. There is some background information about Cain but I would like to know more. One thing that I found really interesting was the fact that romance played such a minor role in this book. It was more like Riley having a crush and finding Cain attractive but it didn't go further than that. Don't get me wrong, as much as I love romance in books, I love how there is barely any romance in this book. It's different from a typical YA book and I found it quite unique.If you're interested in a fast-paced, action-packed, dystopian book, definitely give this book a go! First of all, let me say that young adult dystopian books are not my usual genre. Full confession: I only read this book because the author and I have done some mutually beneficial marketing and I wanted to read and help her with an honest review.But holy crap. Honestly - What an awesomely written book. Seriously, I do not use that phrase lightly. For not being my genre, this book was an absolute pleasure to read (well not a pleasure, per say, cause you know, death and destruction and missing kids, but you get my meaning). From the get-go, there's a dead body in the foyer, and we're running away with the protagonists from a mess the mother caused. Think about all of the crazy nanny-state paranoia conspiracy theories out there and jam it up to a thousand. The government is now your parent, and if your biological ones don't do right by you, then the gub-ment is going to take your baby away. This is the brainchild of Riley's mom, who in her grief at losing a son decided to go on a one-woman mission to tell other parents how to raise their kids. There's a beautiful irony in all of this - the woman who kick-started this mass removal of children suddenly has her own child in the cross-hairs. One of the things I absolutely loved about the way this book was written was how we were thrust into the current state, and then had some flash backs to the past as it made sense. The one quibble - the ONE thing keeping me from giving this five stars (which is a rare rating for me) - was that there were one or two parts where the back story was almost...lazily written? That's a harsh phrasing, but with so much expertly written, it seemed a bit out of place for me. The book itself seemed a little short, but perhaps that is a reflection of me wanting more from this author. That being said, this book is definitely highly recommended for any fans of action, suspense, and young adult writing. I know the author is working on a prequel, but I would absolutely wish for her to take this book into a series. As soon as I read the summary for this book, I knew I wanted to read the book. I love dystopians, and I love the idea of someone's good intentions going wrong and creating something that they never intended to create. That is the case with Riley's mother. Acting out of a desire to protect kids, she wrote a law that was meant to save kids in bad parental situations, but as is the case with a lot of well-intentioned ideas, the government took things too far...extracting kids from good families because of small, silly things like unpaid parking tickets or other nonsense. And then Riley herself, the daughter of the law's creator, suddenly finds herself on the list.I loved the concept behind this story, and really enjoyed the suspense of their chase to leave town and get Riley to safety by hiring Cain Foley, a young man gifted in getting the extracted and their families out of town and to a safe zone. The book takes Riley, her mom and quasi boyfriend on the run from beginning to end. I love quest or journey type books, especially ones like this where there are people chasing and they have to run fast to stay ahead. Naturally, there were some near misses, some fights, and lots of danger. This was definitely a fast paced story that kept you reading and very interested.I liked the characters in this book. I had a special feeling for Riley's mother because you could clearly see the struggle she's going through to know that, no manner how good her intentions were, she is the cause of all this. I felt a deep sympathy for her. I liked Riley as well, but there were times that I had to stop and remind myself that she was 15. She acted much, much younger through most of the book, to the point where I actually had to flip back to the beginning to find out how old she was because her actions, reactions, and just the way she presented herself was much younger than a fifteen year old girl.My favorite part of the story was Cain, though. This was a truly interesting and dynamic character who leaped off the page from the moment you meet him. He's strong, a fighter (woah, is he a fighter), but sensitive at the same time. In one moment, he could fight off half a dozen dangerous men, and in the next, he could turn around and show such a depth of sweetness in nature that he was truly compelling.My favorite part of the story is when Cain begins to teach Riley how to take care of herself. These parts of the story, the friendship that develops, was very interesting to read. At this point, Riley begins to show a little more of a grown up version of herself, and I began to like her a lot more.This book, especially toward the end, was filled with some twists and turns... one I kind of saw coming, the others, however, were shocking. The author did a very good job with this and it definitely left me wanting to read more. Although there was no romance in this book, I am really eager to check out book two to find out if something might develop. The book definitely held my interest, though, and I'll be looking for book two. A good read with suspense and intrigue. The country is broken, both financially and moraly. Kids are being taken away from their seemingly unfit parents in droves. The population believes they are being sent to boarding schools. They don't know how wrong they are. Claire works for the president and the child extraction project is her brainchild. Everything in her life is put into question when her daughter,Riley, shows up on one of the extraction lists. She reacts immediately and they leave home to go on the run. They need to get out of the country with the help of guides. As they move from place to place, the truth about the extracted children begins to come out. Many of them are being sent to post-plague countries to work or be adopted.While on the run, Riley and Claire face betrayal, death, love, and loss as they journey to safety. I'm not going to go into more detail because I hate spoilers but I really enjoyed this book. It starts out strong. It is quick to action and things escalate from there. The story is compelling. I would have loved to learn more about this new world,it's fascinating! I was not as interested in the carachters.That is the only problem I had but, by the end, it had been solved. I found Claire too naieve to be believeable and I found Riley obnoixious to begin with. As Riley evolved, however, she became much more likeable.My favorite line in the book sums up Riley's change as her story persisted. "I no longer wanted to be saved. I wanted to save myself." I love that! I also loved the evolution of Cain. He is a killer until he meets Riley. I finally felt like I understood him when he said, "I'll kill him someday, but not today. Today, I save you." I felt like Cain and Riley were dancing around the inevitable romance that every story has. I've got to say, I was really happythat the author left most of that for the next book. I was afraid it would feel rushed. I know how hard it is for authors to hold off on the happily ever after but rushing it is the worst thing you could do. All in all, I thoroughly enjoyed this read and would definitely reccomend it. What happens when the government turns a well-intended proposal by a grieving mother into a law that strikes fear into the hearts of every parent? We find out in, The Extraction List, by Renee N. Meland. Ms. Meland's young adult novel depicts a world where parents find their children being extracted from their homes and taken into custody by government officials. The author of this horrible law is Riley Crane's mother, Claire. She crafted a proposal after her young son tragically died, hoping to prevent other parents and their children from experiencing the same pain that she did. But those in charge warp her idea and threaten the lives of Riley, and her mother, forcing them to run away with Bo, her mother's friend, as they try to escape the government task force pursuing them.Once the story gets going, it moves quickly. It's action packed and has a few scenes that made me cringe but nothing so awful a teenager couldn't handle it. I caution parents, however, because there are a few f-bombs. Cussing doesn't bother me, but some parents of younger teens may prefer the heads up. Other than that, the evolving romantic interaction between Riley and her crush, Cain, is innocently sweet. The action scenes aren't overly graphic but still evoke emotion from the reader. I was sad when certain characters met untimely, cruel deaths. And of course, I grinned evilly as Cain took revenge against Riley's attacker.Overall, I really like The Extraction List and am curious as to what its conclusion will be. How will these characters end up? Prisoners of the government? Will Riley and Cain become romantically involved? How will Riley and her mother live in this new world Claire unwittingly helped create? I think adults would enjoy it as much as mid to late teenagers would. This is the first book in the series, I believe. A second book is to come and it's sure to entertain and engage the reader. Great start to a young adult dystopian series. 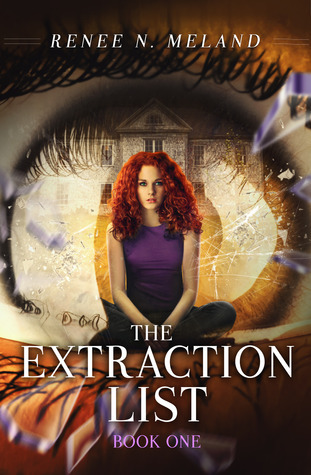 4.25 over-all ratingWriting 4.0story 4.5editing 4.5cover 4.0characters 4.0The Extraction List, by Renee Meland, is a unique, YA, dystopian tale. I would have to say that my favorite aspect is the story. It's well thought out and I think pertinent to what is happening in our current, Big Brother culture. I appreciate a story (especially YA) that gives you something to think about, and the Extraction List does just that!Meland's writing is clear and easy to read. That's another big thing for me. I'm easily distracted and nothing is more distracting than a book that's hard to get through. Although there were times that things were a bit stilted, as far as story progression, over-all it didn't take away from the novel.I appreciated the relationship between Riley and her mom and that the story didn't pivot on a romance (one of my pet peeves), but I have to give character development a 4 rather than a five just because there were times that things weren't consistent. However, a four star rating to me means that it was good, so this by no means is a negative critique.I don't give spoilers in my review, so I'm not going to address any direct content, but I want to close by encouraging fans of YA, Dystopian, or thriller genres to give this book a try! Renee meland has done a fantastic job of crafting a believable story with a whole lot of potential!! Know a young adult you’d like to get hooked on reading? Christmas is coming and the first two books of this series are great stocking stuffers!In the first book, the dystopian world of Riley is presented with an immediate rush of adrenaline filled action. A well intended law, initiated by her mother, has backfired. The Taskforce has shown up on her doorstep, prepared to take Riley into custody for the mandatory Extraction. Your heart will thump within the first scenes as gunfire and blood pepper the pages. From this point forward, the story doesn’t slow down.It’s apparent that a thrilling opening will become a signature of Renee N. Meland, because Between the Cracks and Burning Doors opens with an equally thundering scene. Cain, a character from the first novel, is a child severely abused by his father. In a desperate act, Cain kills his abuser, and almost instantly is thrust into an equally abusive situation. While hiding in an alley, he is witness to the brutal beating of a priest and steps in to the rescue.Thrilling? You bet! Well worth the investment of time, even for someone uninterested in YA or dystopian literature. But, most importantly, this author has opened the door for many young adult readers. I’ve always thought that if a YA author can get one kid love a book they have given that child the gift of a lifetime. How great is that?Very much enjoyed these stories, recommended. **I received this free in exchange for an honest review. **From the outset it was obvious that this story was not going to be like the normal young adult books I’ve read before. The action began pretty much from the first page! The author threw me into the story straight away and I felt I was on as much of a rollercoaster ride as the characters.Riley was a great leading character, she was young and strong, but not annoying. The relationships throughout the book felt really realistic and I found myself drawn into them and feeling everything they did for each other, willing them on!At about quarter of the way through the book I just found myself thinking, ‘I’m really enjoying this book’. Which was a nice feeling! I started to forget to note down points for review because I was so drawn into it. I don’t read much young adult, so this was refreshing to read. It had a great story, deep characters and a plot that kept me guessing!I am really looking forward to the next book in the series, the ending definitely left me wanting to find out more! The Extraction List – Renee MelandAs an independent reviewer for Paranormal Romance and Authors That Rock, I rate The Extraction List by Renee Meland with 5 fangs. This is a story about a world gone wrong. It has gone so wrong that Clair helps enact the Parental Morality Law that deems children be immediately taken away from a family that has proved they are unfit. All seems like it is working until one day there is a government official standing on Clair’s door trying to take her daughter Riley. From there, the story took off on a run for their lives through an underground type system. There are many twists and turns that I didn’t see coming and the characters are believable and likeable. I can’t wait to read the rest in the series!! I've been reading a lot of dystopian fiction lately. Some of it is starting to bleed together in the post-war wasteland that is often our possible future. Here we have a setting that is a very near future, and uncomfortably plausible. The streets look very similar, the infrastructure and government are familiar, but things have gotten a bit grittier. When Riley's mother sponsors a bill intended to help children, the effects are insidious and devastating. It goes from "looks can be deceiving" working-as-intended to "no good deed goes unpunished". The pace clips along and Riley progresses from a somewhat naive student to a girl with growing street-smarts. I'm looking forward to seeing where this adventure takes her! The Extraction List ReviewI love this series! It’s well written and super fast-paced, giving the reader an exciting ride. The characters are great and I am dying to know how it all turns out. I love the creepy premise of the series with the Parental Morality Law and Riley’s mother as the creator of what turns out to be a tool for complete government oppression. Good stuff! Readers who appreciate YA dystopian and thrillers will love this series! Such a great balance of romance, action, and suspense.Highly recommended! The justice a mother is trying to get for her son, backfires. What if the government took even more control in what is right and wrong parenting? The thought of parents having their removed from them if they cannot be good parents, sounds like a pretty good idea to most of us. Riley and her mother Claire now fear what they thought was going to be for the good of other children. How would it feel to be on the run from the government, and from the program you initiated, and the only person to trust and take guidance from is a killer himself? Won this book through a Goodreads giveaway! At first, the main character bugged me because she acted like such a little kid. Then I realized that she probably acts more like a normal 15 year old than most characters in the genre. The story definitely gets more exciting towards the end. I didn't think I would read the next book until I got about 3/4 of the way through. After finishing it, I think I might. Fast pacedSPOILER ALERT I often love dystopian fiction, but the back story to this one was a little too unlikely to swallow. I really liked the characters and the pacing of the story, but the government selling away most American children in a human trafficking scheme to jump start the economy strained and broke my suspension of disbelief. Renee N. Meland - Renee N. Meland resides in the Pacific Northwest with her husband and two dogs. Her favorite obsessions are Rome, learning new recipes, and exploring the world around her. She believes that telling stories is the best job in the world.